to covers of Chuck Berry’s "Maybellene" and Cab Calloway’s "The Man From Harlem". Great Blog entry and video of the Chaz Festival. 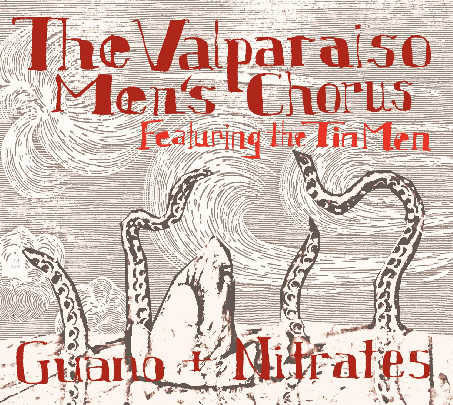 Guano + Nitrates" from the Valparaiso Men's Chorus, featuring the Tin Men. It's an album of traditional shanties. But it is very different from other albums of traditional shanties. It is sung as if by a pub full of drunken rowdies... sung the way sailors would have sung, with no holds barred, cursing and swearing like... well... drunken sailors. Matt Perrine releases - "Sunflower City"
Great Offbeat article on Matt Perrine and his new disk. "LOUISIANA MUSIC FACTORY—The small stage of the Louisiana Music Factory is packed to the edge with musicians. 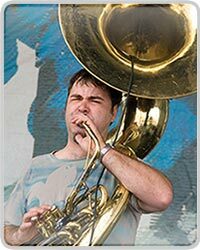 Matt Perrine leads an aggregation of musicians from almost every walk of New Orleans’ musical life to promote the release of his first record, Sunflower City." Alex McMurray talks sea shanties, The Tin Men, bringing back Royal Fingerbowl, and of course, crumudgeons. Sounds of Vitality for New Orleans - Cool Audio slide show from New York Times. 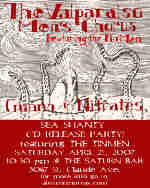 The Tin Men will be playing the great state of New York in June. In response to overwhelming demand to hear some of New Orleans finest musical talent in a festival setting, the first ever Chazfest will be held on Thursday, May 4 at The Truck Farm-- 3020 St. Claude Avenue in Americas own Ninth Ward. The fun begins at 12 noon and carries on all day until 10:00. Along with a veritable whos who of bands that wont be playing at the other music festival taking place in New Orleans at the beginning of May (as well as a couple that ARE!) there will be food served up hot and wet by The Joint, as well as Chef Yvette Yates (of Rio Mar). Weve even got port-o-lets. Between that 'other festival's' two weekends - Thursday 4-May-06 at "The Truck Farm"
Come on out and get yer Chaz On! ANNANDALE-ON-HUDSON, N.Y.-Jazz at Bard presents a benefit concert for the victims of Hurricane Katrina on Friday, October 14, featuring New Orleans musicians the Tin Men, Coco Robicheaux, and special guests. The suggested donation is $20. The concert begins at 8:00 p.m. at Bard College’s Olin Hall.